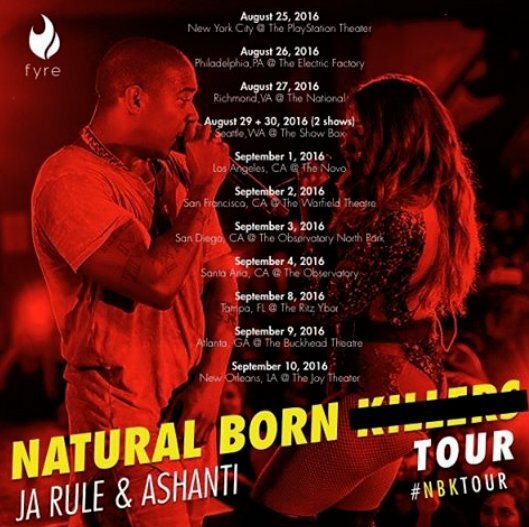 Are you here for an Ashanti and Ja Rule tour?! It really doesn't matter if you are or not because they are headed out on a 12 city tour called the Natural Born Tour. The tour was originally called the Natural Born Killers Tour, however, the artist decided to change of the tour due to the recent violence that has been going on all around the world. The tour will kick off in New York City on August 25th and will last for two weeks, ending on September 10th in New Orleans. This tour could possibly mean new music from Ja Rule and Ashanti, maybe even a joint album. The duo have always made good music and their musical vibes are on point. Either way it goes, its nice to see the two head out on tour and give the fans some throwback hits. I wish them much success on this mini tour and will be watching for new music. Check out the tour dates below. If they are coming to your town, will you be checking them out?